Description: The monument dedicated to Jacques MacConnell is a bronze plaque placed on a slanted slab of granite. The monument faces away from the property and is surrounded by rocks. To the right of the monument is a sign translating the French inscription on the original plaque. The inscription on the plaque honors MacConnell's (McConnell's) service to the nation of France during World War I. AU SERGENT PILOTE AVIATEUR AMERICAIN / JACQUES MAC CONNELL / ENGAGE VOLONTAIRE / DANS L'AVIATION FRANCAISE, LE 27 DECEMBRE 1915. / TOMBE AU CHAMP D'HONNEUR / LE 19 MARS 1917 / DANS UN COMBAT AERIEN / LA FRANCE RECONNAISSANTE. Sponsor: The monument was originally given by the French People. The effort to relocate the monument in 2011 was sponsored by the Town of Carthage and Roland Gilliam, the builder of the airfield in Carthage. Unveiling & Dedication: The monument was re-dedicated on March 19, 2011 when it was moved from its position in front of the old town hall to its new site next to the runway at the Gilliam-McConnell Airfield. The monument was installed at the airfield with a translation of the original French added at the base of the monument. Carthage Mayor Tom Stewart opened the dedication ceremony with remarks honoring McConnell. The memorial and new translation were dedicated by McConnell's niece, Janice McConnell, and additional remarks were given by State Senator Harris Blake and State Representative Jamie Boles. A plane honoring the "missing man" was flown overhead. Post dedication use: The site is a working airfield in Carthage. 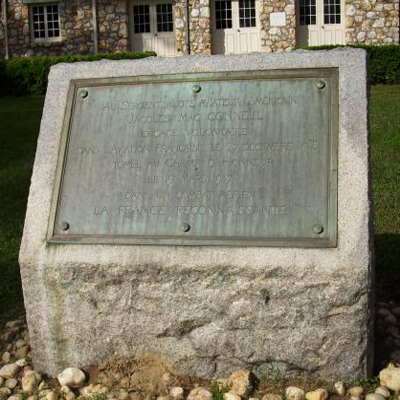 Subject notes: The original plaque was sent from France around 1917 to honor the service of Jacques MacConnell (James McConnell), a citizen of Carthage, N.C. Prior to the U.S. entry into the war, McConnell began his World War I service with the American Ambulance Corps in France and soon after trained as a pilot and joined up with the renowned Lafayette Escadrille squadron. He died over France during an air battle with German fighter planes on March 19, 1917. Today he is celebrated annually in Carthage on Memorial Day. He is also commemorated in another monument in Carthage that sits in Courthouse Square. McConnell wrote a memoir during his time in France titled Flying for France. Roland Gilliam built the airfield in Carthage in honor of McConnell and helped sponsor the effort to move the memorial to the airfield. Location: The monument sits in front of a stone building at the airfield facing the nearby runway. Landscape: The monument sits in the lawn in front of a building at the airfield amidst some small rocks.